The new flat ellipse Lashes give the look of a .15mm with the weight of a .07mm lash. With the ellipse shape these lashes are easy to place on the natural lash and also they are easy to stack lashes on top of them. 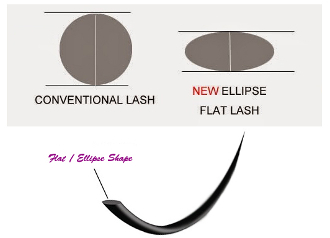 The Flat ellipse shape acts as a "base" to stack lashes on top. The Flat Ellipse Lash has a beautiful sheen that makes them "pop" on the client’s eyes.